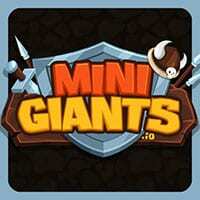 MiniGiants.io is a cool online multiplayer game where you try to survive in the big arena as a mini warrior and evolve into a Giant. In this game, you control a small giant (yes there is such thing), you must attempt to grow your size and try to eliminate other players in the arena. Collect gems and treasure chest around the map. Chests give you rewards and also provide cool weapons and armor for your giant to use in battle. So how will you dominate your opponent and become the mightiest warrior on the server? MiniGiants.io Game is from the same creator as EvoWars and BrutalMania games. So enjoy and have fun in playing this free online game. Various characters to use with different status bonuses. Your character can equip gears that are obtained from the chests. You can upgrade gears to make them stronger. 2D graphics with a top-down view. Press the left mouse button to attack. Press the right mouse button to boost your speed.